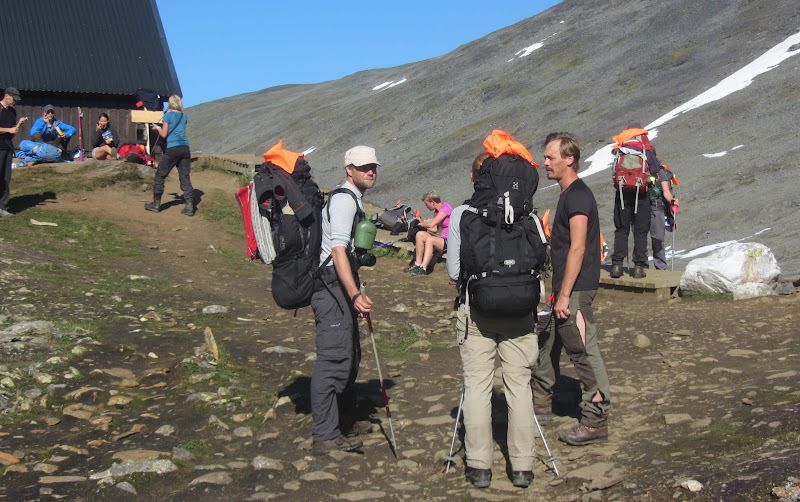 Fjallraven Classic is a mountain "race" organized by Swedish gear manufacturer Fjallraven. Running for its 8 year it takes 2000 participants through some of the most scenic parts of Swedish Lapland. On an assignment for Outside Magazine I was forced to do the hike a bit too fast for my taste. I have done Fjallraven Classic before, in 2007. Here is an article in Swedish about this. Briefly, this is a competition of sorts where you hike 110 kilometers from Nikkaluokta to Abisko in Swedish Lapland. For most people the competing part is not so important. 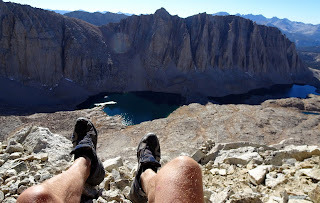 Instead it is for many an opportunity to try on the real mountains for a first time in relative comfort and safety. My impression is that there is a bigger number of young hikers doing the Classic than you normally meet along the trails. Here is yours truly "resting into shape" before the start. I was teamed up with another grizzled participant, journalist Jonas Hållén, who snapped the photo. 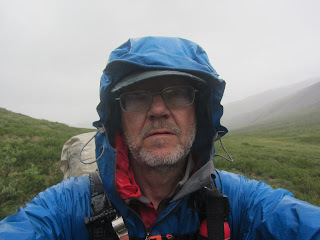 He turned out to be a great companion on the trail and since he was an avid runner and swimmer taking part in multisport events he had my tongue hanging on my chest for much of the hike. Pretty lucky actually, since both of us for work and family reasons were on a tight schedule. The windshirt is on a test from Haglofs, an 85 gram hoodie that will be out on the market next year. Here I am at the first checkpoint, waiting in line to get my stamp. The shirt I wear is an Icebreaker Polo and I am also wearing a pair of Icebreaker Distance shorts. These, made from merino wool, work as both underwear and shorts. My trademark cap is of course homemade and has no equals, for good or bad. Made from Pertex Equilibrium. When the mists lifted that morning it turned out to be the beginning of two days of hiking in 25 C degrees without a cloud in the sky. 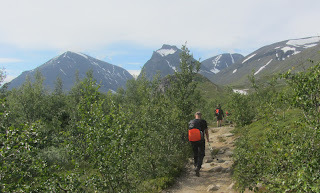 Obviously the marketing department at Fjallraven had good connections with the weather gods. 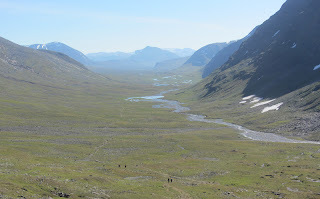 We trundled up wide and glorious Tjakjavagge (vagge=valley in Sami) heading for the Tjakta pass, the highest point on the trail, but not particularly demanding for experienced hikers. This turned out to be our longest day. 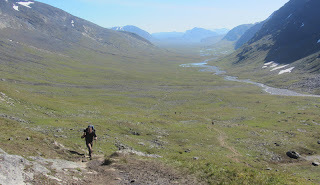 In order to reach the goal in Abisko around 3 pm the following day we had to put in more than 35 kilometers. At Alesjaure checkpoint Jonas took a cold, cold bath in the lake while I just cooled my heals in it, sipping a Coke. When we moved on around 8.30 pm Jonas was invigorated and I was just chilled and tired. Maybe I should have taken a dip myself. 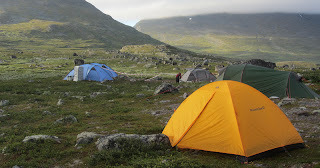 Around 10 pm we put up our tents and had our evening meal, both thoroughly tired after having added another 7 kilometers, making it a 46 kilometer day. I have travelled 35 kilometer days before, but the normal daily walk for me is 24-27 kilometers. Many hikers took advantage of the sun and the comparative coolness by one of the creeks we passed to soak up some sun and rest their feet. We were however on a tighter schedule and kept moving, skipping lunch and letting the pancakes do their duty. Being one of the last groups to start, Jonas and I had been passing hikers that enjoyed a more leisurely tempo than we did. We kept a good pace but did not rush or run since it now was obvious that we were on schedule and that Jonas would have time for a shower and a beer before his train left. Chinese television was doing interviews in Abisko and we desperately tried to get into the picture but had to satisfy ourselves with getting the team into our own picture. Later that night I met reporters from both Backpacker and TGO Magazine, so Fjallraven Classic is becoming quite a thing in its eight year. Well deserved, it is a solidly organized event that brings new hikers from many countries into the mountains. It is difficult not to imagine that quite a few of those will be back in one shape or another. That's a very good thing in my book. Sounds good and that laid back relaxed pose looks familiar, no matter what the weather. Well done on such a fast walk. Good work Jörgen. Nice to see someone had all the sunshine! Is the orange clothing requirement so no one gets shot?! What time did you start ? i started at Saturday 16.00, would have been nice to meet .. Cheers to Pascal and Henrik. Looking forward to trying the new Gram comp line ..
Roger: "A mans gotta do what a mans gotta do"
Henrik: We started Sunday at 9 pm. And yeah, gear talk is always interesting.